Home > News / Press Release > ZOA Exposé: Antisemitic Rep. Omar (D-MN) Funded by Israel-hating BDS Leaders and PACs-Remove Her From Committees! ZOA Exposé: Antisemitic Rep. Omar (D-MN) Funded by Israel-hating BDS Leaders and PACs-Remove Her From Committees! Again and again, Israel-hating Congresswoman Ilhan Omar (D-MN) has displayed frightening, deep-seated, dangerous antisemitism and hatred towards the Jewish people. Rep. llhan Omar falsely called Israel “evil” and an “apartheid regime.” She promotes anti-Israel boycotts, divestment and sanctions (BDS) – the delegitimization and economic destruction of Israel – after lying to voters about her views on BDS while running for Congress. Ilhan Omar also sought reduced sentences for ISIS terrorists — a position that endangers every American. And she’s never apologized for any of these issues. 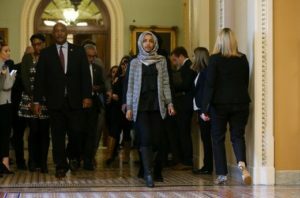 While the recent condemnations of Rep. Omar by the Democratic House leadership are an important first step, they are not enough, especially in light of Omar’s phony “non-apologies,” which she immediately backtracked on by again defaming Jews and Israel. ZOA initiated the call for real consequences and we continue to call for them: Ilhan Omar must be removed from the House Foreign Relations Committee – a position that enables Rep. Omar to harm U.S.-Israel relations and mainstreams her antisemitism. ZOA initiated the call for real consequences and we continue to call for them: Ilhan Omar must be removed from the House Foreign Relations Committee – a position that enables Rep. Omar to harm U.S.-Israel relations and mainstreams her antisemitism. See “ZOA to Pelosi: Rescind Appt. of Anti-Semite Israel-Hater Rep. Omar to Foreign Affairs Post,” Jan. 18, 2019. ); and “ZOA: Remove Anti-Semite Rep. Ilhan Omar (D-MN) from Committee Assignments & Vote on Rep. Zeldin’s Antisemitism Bill,” Feb. 11, 2019. Hypocrisy Alert! 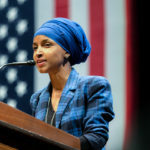 : Rep. Omar’s anti-Semitic tweets that a Jewish lobby and Jewish money cause Congress to support Israel are both wrong and extraordinarily hypocritical. Congress supports Israel because the American people, both Jew and non-Jew, support Israel and because it’s the moral thing to do, and because both nations share democratic values and strategic interests. 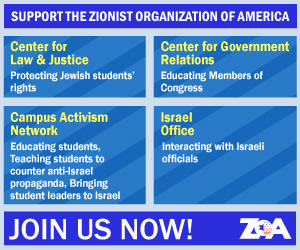 ZOA’s analysis of Rep. Omar’s Federal Election Commission (FEC) filings shows that Rep. Omar’s financial supporters include a veritable “Who’s Who” of the worst anti-Israel propagandists and haters and anti-Israel PACs– including CAIR; BDS leader and Students for Justice in Palestine (SJP) founder Hatem Bazian; and anti-Israel Arab-American Institute (AAI) president James Zogby, who called Israelis “Nazis,” praised the deadly Intifadas as a “good story,” and has been a leading architect of propaganda themes used to pry progressive Jews away from supporting Israel. And a slew of others. Prof. Hatem Bazian – founded the virulent and sometimes violent anti-Israel organizations Students for Justice in Palestine (SJP) and American Muslims for Palestine (AMP). His agenda is Israel’s destruction. Bazian is a leader of the anti-Israel boycott movement on campuses and throughout the world, called for “intifada” in the U.S., and persistently spreads class anti-Semitic falsehoods against Israel. IPT(the Investigative Project on Terrorism) also noted that Bazian uses “Islamophobia” accusations to minimize terror support prosecutions and to attack fellow Muslims who supported ousting the former Muslim Brotherhood government in Egypt. Bazian gave Ilhan Omar contributions on 8/8/2018, 8/12/2018 and 9/12/2018. CAIR (Council on American-Islamic Relations) – an unindicted co-conspirator in the Holy Land Foundation terror financing trial, for funneling money to Hamas. FBI testimony reportedly indicated that CAIR is a Hamas front group. IPT detailed CAIR leaders’ undisputed statements supporting Hamas, and that U.S. District Court Judge Jorge Solis, who presided over the HLF trial, ruled in 2009 that the government’s evidence creates “at least a prima facie case as to CAIR’s involvement in a conspiracy to support Hamas.” CAIR-CA PAC gave Ilhan Omar $5,000 on 8/13/2018. In addition, CAIR-CA Los Angeles Executive Director Hussam Ayloush gave $1,200 to Rep. Omar on 8/6/2018. Also, CAIR Florida Executive Assistant Shari Akram gave Rep. Omar another $500 on 9/17/2018. CAIR is on Open Secrets’ list of Rep. Omar’s top 20 contributors. James Zogby – president of the anti-Israel Arab-American Institute (AAI), co-founder and chairman of the anti-Israel Palestine Human Rights Campaign, a campaigner on behalf of the National Emergency Committee to Defend Ziad Abu Eain (to try to prevent the extradition to Israel of a Fatah terrorist who killed two Israeli teenagers and wounding thirty-six other Israelis), and a major anti-Israel propagandist and political adviser (including to Bernie Sanders). Zogby accused Israel of committing a “Holocaust” against the Palestinians, called Israelis “Nazis,” and called Cuban-American Congresswoman Ileana Ros-Lehtinen an “Israel-firster” – an anti-Semitic trope implying dual loyalty. Zogby also praised the Intifada as a “good story,” and was a leading architect of propaganda themes used to pry progressive Jews away from supporting Israel, including falsely portraying Israel as an anti-Democratic occupier and oppressor of innocent Palestinians. (See “Meet Bernie Sanders’ Israel Hating Advisers: Jewish Democrat Taking Advice From Israel Critics,” by Adam Kredo, Washington Free Beacon, Feb. 8, 2016; and “How James Zogby Seduced Liberal America,” by Charles Jacobs, The Forward, July 6, 2016.) Zogby gave Rep. Omar $2,700 on 10/2/2018. Rashida Tlaib – fellow newly-elected anti-Israel Congresswoman Rashida Tlaib celebrated her election win by wrapping herself in the flag of Mahmoud Abbas’ murderous, hostile, Palestinian-Arab regime, which pays terrorists to murder Jews and Americans. Tlaib supports replacing all of Israel with a Palestinian Arab state, repeatedly hurls false accusations at Israel, says that Israel doesn’t deserve human rights, and invoked antisemitic disloyalty-to-America smears against U.S. Senators who sponsored an anti-BDS bill. (See “ZOA Condemns Newly-Elected Rashida Tlaib (D-MI) For Wrapping Herself in P.A. Flag, Lies About Israel,” Nov. 13, 2018, and “Jewish Press | ZOA’s Klein Op-Ed – Rep. Tlaib’s Vicious Anti-Semitism,” Jan. 21, 2019.) Rashida Tlaib donated funds to Rep. Omar on 7/29/2018, 8/26/2018 and 9/30/2018. California Islamic University Prof. Nasreen Khan – Cal-Islam’s website states that “Everything we teach is based on the Qur’an and the authentic teachings of[the rest is missing]” and that the school will provide students “with a core foundation to filter un-Islamic ideas as well as arm them with tools needed to spread Islam wherever they go.” Khan contributed to Rep. Omar on 8/14/2018. Soros-funded MoveOn.Org – MoveOn.org’s anti-Israel actions have included attempting to kill the pro-Israel anti-BDS bill, and essentially blackmailed Congresspersons not to support the Iran deal. MoveOn.org also co-founded the anti-Israel pro-BDS organization Avaaz, which initiates numerous extremely offensive, falsehood-filled anti-Israel petitions, campaigns, and protests, including campaigns to release Palestinian-Arab terrorist Ahed Tamimi, and the campaign for Ireland’s dangerous BDS Bill. MoveOn.Org Political Action gave Rep. Omar $5,000 on 7/26/2018, making it one of Omar’s top 20 contributors. Hamas Scarf-Wearer – The Facebook page profile photo of a donor to Rep. Omar’s campaign shows him and his wife wearing keffiyah-style Hamas scarves over their wedding clothes. The scarves state in Arabic: “Jerusalem is ours – WE ARE COMING!” and include maps in the shape of Israel, over-written with the words: “Palestine” and “From the river to the sea!” – the well-known phrase calling for Israel’s extinction. This Hamas scarf-wearer gave Omar $500 on 8/2/2018. OneVoice:The Senate Permanent Subcommittee on Investigations’ 2016 bi-partisan staff report found that OneVoice used campaign infrastructure built with $350,000 of taxpayer money, granted by Pres. Obama’s State Department, to fund election efforts to oust Israeli Prime Minister Benjamin Netanyahu. (“Obama Admin. Sent Taxpayer Money to Campaign to Oust Netanyahu,” Washington Times, July 12, 2016; and “Appalled by Obama Admin. Hypocritical Interference with Israel Elections, ZOA, Feb. 11, 2015.) OneVoice gave Rep. Omar $1,000 on 9/27/2018. Soros-funded Bend the Arc Jewish Action Inc. PAC– Anti-Zionist George Soros’ son, Alex Soros, founded and is the Chairman of the “Bend the Arc Jewish Action PAC,” initially headed by a former J Street official. Blogger Victor Rosenthal explained that Bend the Arc funnels Jewish contributions to the same left-wing politicians who support anti-Israel policies. But because Bend the Arc doesn’t mention Israel, Bend the Arc enables left-leaning Jewish contributors to donate to anti-Israel politicians (such as Ilhan Omar) without feeling guilty about betraying their people. (See “Bending the Arc — Away From Israel, by Victor Rosenthal, May 1, 2015.) Bend the Arc Jewish Action PAC gave $1,000 to Rep. Omar on 8/21/2018. Debbie (Dhabah) Almontaser– Almontaser is infamous for defending AWAAM (Arab Women Active in Art and Media) for hawking T-shirts that glorify Palestinian terror. The T-shirts said “Intifada NYC.” Intifadas are the deadly Palestinian-Arab terror wars on innocent Israeli citizens. Almontaser argued that “Intifada” just means “shaking,” and further stated: “I think it’s pretty much an opportunity for girls to express that they are part of New York City society . . . and shaking off oppression.” Almontaser was also a leader of the Saba Association of American Yemenis, which reportedly provided free office space to AWAAM. Then-NY City Mayor Bloomberg, the United Federation of Teachers, and members of the public demanded that Almontaser resign as principal of a controversial Arab language and culture public school in Brooklyn. (See “City Principal Is ‘Revolting’,” by Chuck Bennett, NY Post, Aug. 6, 2007.) Almontaser gave Ilhan Omar $500 on 10/19/2018. Pelosi for Congress: Disappointingly, Speaker Pelosi’s campaign fund, “Nancy Pelosi for Congress,” gave Rep. Omar $2,000 on 9/10/2018. Now that Rep. Omar has repeatedly displayed her deep-seated anti-Semitic worldview, and now that Speaker Pelosi has condemned Rep. Omar, saying that “Omar’s use of anti-Semitic tropes and prejudicial accusations about Israel’s supporters is deeply offensive,” we hope that Speaker Pelosi will discontinue all financial support of Rep. Omar, as well as immediately remove Omar from the House Foreign Relations Committee. Oil Money: Rep. Omar accompanied her most recent non-apology with a new tweet condemning AIPAC and fossil fuel lobbyists, stating: “At the same time, I reaffirm the problematic role of lobbyists in our politics, whether it be AIPAC, the NRA or the fossil fuel industry.” Hypocritically however, despite also signing a pledge not to take fossil fuels money, Omar accepted contributions from oil interests, including:$2,000 on 8/2/2018 from Beowulf Energy principal Nazar Khan (Beowulf Energy’s website states: “We develop, acquire, own, and operate power, oil & gas, and industrial facilities worldwide.”); another $2,000 on 9/25/2018 from Giant Oil president Basem Ali (Giant Oil’s website states that it is a petroleum company that partners with Chevron, ExxonMobil, Marathon Oil and British Petroleum); and $400 from ExxonMobil IT specialist Razi Asaduddin. PAC Money: Further revealing Rep. Omar’s hypocrisy, Open Secrets calculated that Rep. Omar received approximately $190,000 from PACs (political action committees) for her 2018 election. Rep. Omar must be isolated, defunded and removed from positions meaning from every committee where she can carry out the extremist anti-Israel anti-American agenda of those who are backing her financially.